Rain barrels are a small version of an above-ground cistern. They can range in size from 50 to 200 gallons, in contrast to cisterns that range in size from 100 to 1500 gallons or more. Rain barrels decrease rainwater runoff by collecting and storing rainwater from the roof. In addition, rain barrels provide, at no additional cost, chlorine-free water for use in watering plants and other water needs in the landscape. A rain barrel is a barrel fitted with an upper (overflow) spigot and a lower spigot (for use in watering vegetation, etc.). The top is fitted with a screen or filter to keep debris and insects out of the barrel. It is a simple design that is inexpensive to construct. Rain barrels should be placed under a gutter downspout, with the downspout directed into the top of the rain barrel. It is helpful to elevate the rain barrel off the ground since the output for watering is gravity flow. The overflow spigot at the top of the rain barrel should have a hose connected that is directed into a rain garden or other landscape planting. More than one rain barrel can be used at each gutter downspout by connecting them together with the overflow spigot, or consider a larger above- or below-ground cistern for harvesting a higher volume of rainfall. There are many models to choose from, or you can build your own. To build your own rain barrel download the River des Peres Watershed Coalition’s Rain Barrel Building Instructions and Installation Guide. A cistern is a water storage tank installed either underground or above ground (size varies from 100 gallons to 1500 gallons or more). Water is captured and stored from gutter downspouts diverted into the cisterns, making it available for later use. The most common use is for watering the surrounding landscape. A household shallow well pump can be installed to pump and distribute this stored water from the tank to a hose bib for watering, or may be connected directly to drip irrigation equipment, etc. This cost-free source of water contains less minerals and chemicals and aids in healthier plant growth. Cisterns help to reduce the peak flow of rainwater that could otherwise contribute to flash flooding, erosion and pollutants by not allowing the rainwater to flow over lawn and impervious surfaces. For each inch of rainfall, 0.62 gallons of rainwater can be collected per square foot of roof area. The Greater St. Louis region has an average annual rainfall of 38.75 inches, therefore it doesn’t take long to fill a 500 gallon cistern. The size of the cistern is determined more by the anticipated water usage than by the potential quantity of water to be collected. 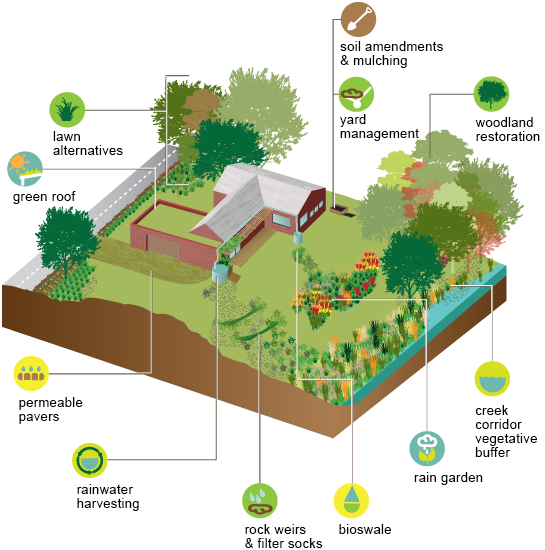 The overflow can be directed into a rain garden, a bioswale or other landscape plantings. See Rainwater Harvesting Resources for additional information.